With disturbing frequency we have noted here during the past few weeks many examples of BBC reporting which are in fact part and parcel of the corporation’s ongoing advocacy campaign in support of Hamas’ demand to lift border restrictions and the naval blockade on the Gaza Strip. In none of those reports were BBC audiences given a clear, accurate and factual picture of the nature of restrictions themselves and at no point has the BBC explained that what brought about, and sustains, that Israeli policy is terrorism against Israeli civilians emanating from the Gaza Strip. On August 13th those repeated failures to accurately and impartially inform BBC audiences were further exacerbated by the appearance of an item on BBC television news and on the BBC News website purporting to provide background information on the topic. With the Yezidi community currently under existential threat in Iraq and the death-toll in Syria continually passing ever more tragic milestones, the BBC’s description of border restrictions on the Gaza Strip as an element of the “Mid-East crisis” can only be interpreted as a reflection of its priorities and vision. 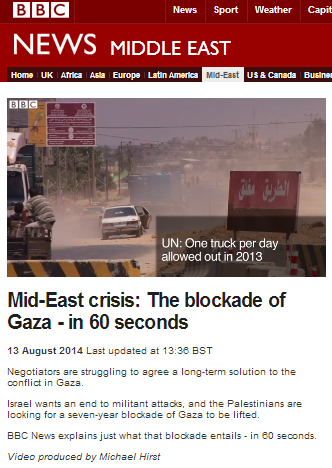 “Mid-East crisis: The blockade of Gaza – in 60 seconds” was produced by Michael Hirst of the BBC News website and in that backgrounder viewers are presented with a series of captioned images. Yet again the BBC fails to clarify that the June 2007 Hamas coup itself was not the prime reason for tightened border restrictions but the subsequent rise in terror attacks against Israeli civilians which caused the Israeli security cabinet to declare the Gaza Strip hostile territory in September 2007. Clearly audiences cannot hope to understand this issue fully as long as the BBC continues to erase the topic of Hamas terrorism from the picture. All governments of course have an obligation to provide security for their citizens and a border with a territory ruled by an internationally proscribed terrorist organization is clearly going to demand stringent control, but the BBC manages to make Israeli actions sound exceptional and unreasonable. The all-important context of weapons smuggling into the Gaza Strip by sea is erased from the picture presented to BBC viewers. Again – it is Egypt’s right and responsibility to do so. Notably the crucial context of Gaza Strip-based terrorism in northern Sinai is not mentioned. Only imports via Israel are controlled by Israel (not those coming through Egypt) and all imports are permitted with the exception of weapons and a specific list of dual-use goods which can be used for the purposes of terrorism. During times of hostilities such as the present, when the Kerem Shalom crossing is often attacked by terrorists and its staff thus endangered, entry of goods to the Gaza Strip may be limited to aid, medical supplies and basic goods, with non-essentials such as cars or washing machines given a lower priority. Normally the entry of goods is a function of demand from Gaza-based businesses. The only restricted items are those same dual-use goods which can be appropriated for terrorism purposes. Even they can be imported into the Gaza Strip if the construction project is guaranteed by an international body to be for civilian purposes only. Again, civilian projects guaranteed by an international body can import the necessary materials. One would think that the BBC would have seen enough evidence recently – including with its own journalists’ eyes – to make the use of the caveat “Israel says” superfluous to that statement. Remarkably, the BBC has shown no interest whatsoever in investigating the issue of the methods and route of appropriation of construction materials for the purpose of building those cross border attack tunnels or in reporting on the civilians projects which did not come into being in the Gaza Strip because of the commandeering of those materials. There is no restriction whatsoever on exports abroad. Israel in fact helps farmers in the Gaza Strip to bring their produce to international standards and to export it, for example, to Europe. As the relevant monthly reports show, from February 2013 to December 2013 inclusive (the data for January 2013 is not available), a total of 560 truckloads of exports left the Gaza Strip in 334 days. Clearly that UN claim repeated by the BBC is inaccurate. Most of the exports from the Gaza Strip are agricultural and therefore seasonal in nature. Thus we see, for example, that in February 2013 a total of 109 truckloads of exports left the Gaza Strip. That isolated statistic is of course of no use to BBC audiences and notably they are given no information regarding the political agenda of its supplier. Viewers have no way of comparing that figure with food insecurity in other parts of the world or with previous years before border restrictions had to be implemented because of Hamas’ policy of both itself engaging in terrorism and permitting other terrorist organisations to do so from territory it controls. In summary, this backgrounder is doubly problematic in that it provides BBC audiences with inaccurate information on the one hand whilst failing completely to supply the vital context concerning the terrorism which is the cause of border restrictions and the naval blockade on the other. As an attempt to meet the BBC’s obligation to provide audiences with information which will enable them to understand “international issues” it is neither use nor ornament. As part of the BBC’s continuing campaign to amplify and promote the current Hamas agenda, this backgrounder definitely fulfils its purpose. And how are you going to guarantee the proceeds go o the people who need it- We have already seen that after Israel allowed in cement to build schools- HAMAS built tunnels instead. . So I will not donate- Billions of dollars are sent to Gaza every year- Let this money be used for the puropse you say- That way it will not be used for rockets. Hadar, Is there no way that all your observations can be categorised and presented first to the BBC and the Broadcasting Ombudsman laying out clearly the BBC’s breaches of its charter of being objective. If this fails to bring about the necessary objective reporting change of policy then it needs to be brought before either a British court or parliamentary commission with prior legal scrutinisation which will analyse your comments and expose this BBC biase. I personally think you are doing a brilliant job. News reporting always needs to state the facts and minimise opinions. Bravo for all your excellent work!. Packaging; I think it may be your computer setup. They won’t load for me if I look from my work’s computer, which is very locked-down both security-wise and to restrict the kind of sites we can access (no social networking sites, few blogs, no e-bay or sexually explicit stuff, etc.) But the site loads fine from my Win8.1 home PC and my Android tablet. Hope this helps.